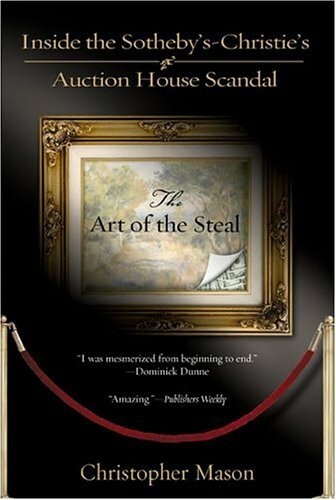 THE ART OF THE STEAL is the explosive inside story - the only book to tell the whole truth and dish the dirt on the price-fixing scandal that rocked the art world and put one of the richest men in America behind bars. Brilliantly written and reported, it tells the story of the larger-than-life figures who quaffed champagne while conspiring to cheat clients out of millions. Christopher Mason is the only reporter who has persuaded all the key figures (and hundreds more) to spill the beans. He has followed the trail of this story from galleries and boardrooms in London, Paris and New York to parties in Palm Beach to courtrooms in Lower Manhattan. A swirl of excitement has surrounded the book: an appearance on Good Morning America, articles in the New York Times and the New York Post, and rave reviews in The Economist, artnet.com, The Spectator, Fortune, The Daily Telegraph, and Sunday Times. “...a rare beast -- a genuine antitrust thriller, a gripping yarn of real-life collusion that is spiced up with Picassos, class warfare, art-market bitchiness and the rather unsettling conclusion that some well-heeled villains got away with it. "An excellent book, thoroughly researched, well-written with a good eye for detail and some wonderful anecdotes." "Meticulously researched, contains much valuable new information . . . [Mason is] a one-man church confession box . . . full of the wholesome pleasure of watching the English upper classes knocking each other about . . . [probably] the last word to be written; and it will be an indispensable source for establishing the truth." "Gossipy and extensively researched . . . [Mason] writes fluently, and portrays this milieu—the money to be made trading in other people's belongings—and the people engagingly. It is filled with classic eighties types: men and women whose enthusiasms are chiefly vanity, ambition and greed. "The fascinating true story of a big-business scandal that rocked the international art world and the sensational trials that followed. Brilliantly written and meticulously reported . . . nothing short of mesmerizing." "An amazing and depressing chronicle of greed in the name of culture that should (but probably won't) keep art buyers from ever walking into an auction house again.